Africa: Are the Days of WhatsApp Chain Messages Numbered? Cape Town — "Saturday morning whatsapp will become chargeable. If you have at least 10 contacts send them this message." Sound familiar? 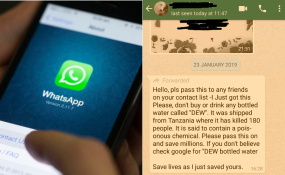 This and more chain messages - many of which promise anything from discounts on Louis Vuitton handbags to good luck for the year or a health hazard warning - may become less frequent if WhatsApp has its way. The Facebook-owned company announced that it will limit to five the amount of times users may forward a message. The move comes in an effort to curb "misinformation and rumors", Reuters reports. WhatsApp said in an official statement: "Today, we're launching a test to limit forwarding that will apply to everyone using WhatsApp. In India - where people forward more messages, photos, and videos than any other country in the world - we'll also test a lower limit of 5 chats at once and we'll remove the quick forward button next to media messages." According to Naked Security, the move is a response to lynchings after a message sent to WhatsApp groups, which included a video of four men distributing chocolates to schoolchildren, resulted in one of the men getting attacked by a mob. Users were previously able to forward a message to 20 people or groups. The change "will help keep WhatsApp focused on private messaging with close contacts". Advertising scams rely on WhatsApp users forwarding a luring message to their contacts in return for supposed free vouchers or air time, or access to a list of people due to be paid money, Business Insider reports.